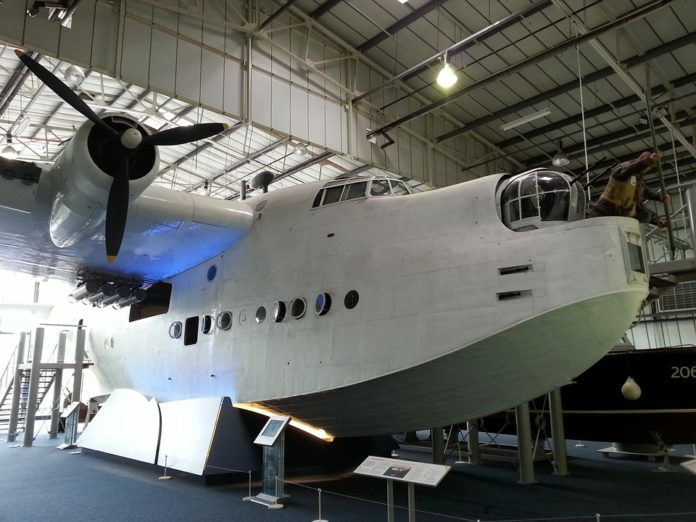 The Short Empire flying-boat captain’s role had a nautical and imperial flavour that has long gone. The captain of an Imperial Airways (and the sister operators of the type, Qantas and Tasman Empire Airways Ltd) flying-boat had a level of autonomy unknown today – more like a ship’s Master, and was able to decide the detail and height of the route, though the timetable was as sacrosanct as far as weather and serviceability would allow. Nevertheless, it was common to divert to show passengers points of interest along the routes, such as animal herds over Africa. Though expected to act in a formal manner, most crews were on first name terms unless the captain was one of the more idiosyncratic or autocratic men of the era. Orders given by the pilots were repeated back, nautical fashion. Imperial Airways’ first officers were also issued with white boiler suits, worn when working around the aircraft, while conversely the crew’s uniforms were not to be worn off duty in clubs, bars or hotels. Operation of a big, four-engined flying-boat on water required specialised skills. And these flyingboats were operated not just from established ports at large cities like Southampton, Sydney and Auckland, but also from more primitive facilities such as rivers and even the remote, tropical island base at Groote Eylandt, off the north of Australia. Empire boat captains were required to hold ‘B’ Licences, a First Class Navigators Licence (known as a ‘First N’), ‘A’ and ‘C’ Engineers Licences and most of them also had Wireless Operators Licences. These could also be covered by the Master Air Pilot’s Certificate. Pilots were limited to fly no more than a theoretical 125 hours in a 30-day period. Despite initial plans for night operations, standard flights were undertaken during the day, with the occasional dusk alighting and frequent early starts. Flights from the UK to Australia were nine and a half days, with the ‘boats flying at 140kts on each daytime leg. Equipped with three-axis trim controls and a state of the art Sperry autopilot, the pilots had a great deal of support. While the autopilot was very efficient, at these low levels, and in rough weather it was often necessary – at least for passenger comfort – for both captain and first officer to fly a ‘boat manually, together. A certain amount of blind flying was inevitable with the weather, but there was no comprehensive invisible web of support that modern navigational aids offer today. Pilots had to manage with only radio signals and bearings from stations then available. If they arrived at a destination during the night, there would usually be only ground lights to identify the location and moored flares to outline a water runway, while the aircraft itself was equipped with an ‘alighting searchlight’. LEFT: A wonderful impression of the size and impression of one of these machines – Caledonia in flight.